Those with access to online video sources on their TV are more likely than their counterparts to be reconsidering the value proposition of incumbent pay-TV services. 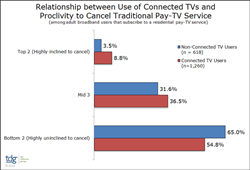 According to a new report from The Diffusion Group (TDG Research), Net-Connected TV User Dimensions, adult broadband users with an Internet-connected TV are twice as likely as those with non-net-connected TVs to be “highly inclined” to cancel their current pay-TV service. This is but one of many important topics discussed in Net-Connected TV User Dimensions, TDG’s newest report on shifting consumer video behavior in the home. The report offers a data-drive profile of connected TV users and household, juxtaposing this quantitative profile against that their non-connected TV counterparts. Net-Connected TV User Dimensions is now available to all TDG Members. To purchase or learn more about this research, non-Members should visit TDG’s website or can contact Laura Allen Phillips at 469-287-8060 or lap(at)tdgresearch(dot)com.